Psoriasis is a long -term autoimmune disease which affects the skin, resulting patches of red, scaly skin, which are typically extremely itchy and painful. This condition affects 2% of Australia’s population and conditions can vary from localized in one area, to complete body coverage. Common problem areas for psoriasis are: knees, elbows, scalp, torso, palms, and the soles of feet. It is known to have a varying or fluctuating course, where the disease improves and then worsens, and is thought to be incurable but not untreatable. Psoriasis can occur in anyone from babies, to elderly people, but the most common age of diagnosis is in early adult years. This chronic disease is caused the rapid increase in the production of skin cells, which, when these skin cells reach the surface and die, their sheer volume causes a build-up, and raised red plaques covered in white scales appear. This increase in the production of skin cells is caused by the immune system being ‘triggered’ by environmental factors, resulting in the production of excess inflammatory chemicals. Studies show that people with psoriasis are more susceptible to illnesses such as diabetes, heart disease, and psoriasis sufferers are between 10 and 30% more likely to develop psoriatic arthritis. 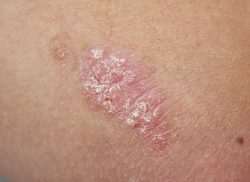 Plaque psoriasis: This variation of the disease makes up 90% of psoriasis cases. It is characterized by red, raised patches with white/silver scales on top. Guttate psoriasis (eruptive psoriasis): This form is characterized by ‘drop-shaped’ lesions on the body (mainly on the torso and limbs), and most commonly occurs in children and young adults. It is usually triggered by a bacterial infection, e.g. the streptococcal bacterial infection. Inverse/Flexural psoriasis: This variation is characterized by bright red, shiny lesions that occur in skin folds such as the armpits, groin area, abdominal folds, and under the breasts. This is usually caused by aggravation due to sweat and skin rubbing together, and yeast overgrowths. Pustular psoriasis: This form commonly presents with small non-infectious pus-filled blisters. It is a less common form of psoriasis, and can be quite painful. Erythrodermic psoriasis: This is the rarest form of psoriasis, and looks like large, severe burns covering large portions of the body. It can be extremely painful and can sometimes require hospitalization, and the rash constantly itches and burns. This form often develops from other, less severe, forms of psoriasis. Palmoplantar psoriasis: This is the variation where the palms of the hand and/or the soles of the feet are involved. Nail involved psoriasis: This affects about 50% of psoriasis sufferers, and is characterized by nail pitting, discolouration, grooves, loosening or crumbling of the nail, thickened skin under the nails, and coloured patches or spots under the nails. Scalp psoriasis: This is where the psoriasis progresses to the scalp, causing severe dandruff, itchiness (especially around the hairline), hair loss, scalp infections, and even difficulty in performing regular hair hygiene. It can often extend onto the face, neck, and ears. Psoriatic arthritis: This is a destructive form of arthritis that affects any joints, but mainly the joints of the hands, knees, and ankles. This form of arthritis is diagnosed when psoriasis sufferers also have painful and swollen joints. Psoriasis annularis: This rare form of psoriasis is characterized by circular or ring-like lesions of psoriasis. Napkin psoriasis: Occurs in infants in the diaper area, resulting in typical plaques, or a red, weeping rash. Biologic therapies (severe cases): These are injected into the skin and work by suppressing portions of the immune inflammatory response that occurs in psoriasis sufferers. Examples of these drugs are: adalimumab, infliximab, etanercept, and ustekinumab. St John’s Wort: This herb is used to treat burns, bruises, wounds, ulcers, and skin complaints such as psoriasis and eczema due to its effectiveness as an anti-inflammatory agent.